My parents have been married 35 years this coming year. To celebrate they’re thinking of taking the six of us on a city trip. We were trying to decide what would be nice to visit, thought of Glasgow and Copenhagen. Surfing for more info however, we found a site on the Baltic states and, being fans of the colder climates, were quite taken with the idea of going to one of their capitals. So it’s beginning to look like I’ll be visiting Riga (Latvia) early next year. Can’t wait! The Historic Centre of Riga has been declared a UNESCO World Heritage Site, and the city is particularly notable for its extensive Art Nouveau (Jugendstil) architecture, which UNESCO considers to be unparalleled anywhere in the world. The climate of Riga is maritime and temperate, but the winters can be extreme due to the northern location. The coldest months are January and February, when the average temperature is -6°C but can frequently drop as low as -25°C. For lots of photo’s, try Riga on Wikimedia Commons. 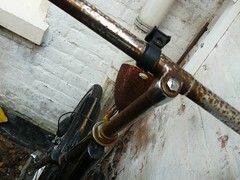 I’ve had my current bike for almost 5 years now and it’s starting to rust. I hope it can last another wet autumn, it recently started creaking when I’m making my way across bridges and such. Never a good sign. So I’m thinking maybe it’s time to get a new bike. My dad’s working on a cool shelter so at least it can be stored free of rain. Two reasons to be happy it’s September: summer’s pretty much over and it’s time for the concert tours to come round this way. I’ve got some great shows lined-up already: Anathema and Demians in Tivoli Utrecht, Madrugada also in Tivoli Utrecht, Porcupine Tree in 013 Tilburg, Hermano in Patronaat Haarlem. Shame all the tickets look the same these days, and don’t get me started on the e-Tickets. What kind of memento is that? Update: unfortunately the entire Madrugada tour has been cancelled, so I’ll have to return those tickets. 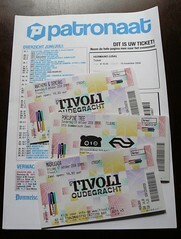 Some good news too: got Tickets for Haggard in Kasteel Alphen and Riverside in Paradiso Amsterdam.